Yet his writings and outer life give a profound glimpse into the life of this unique spiritual master. Sri Aurobindo paved a new approach to yoga, which he termed ‘Integral Yoga’. Unlike the Yogi’s of old he felt yoga and spirituality need not involve retreating from the world. Sri Aurobindo wished to bring the Divine into all aspects of life. For the last 40 years of his life he worked tirelessly for this goal of bringing down a new spiritual consciousness. Sri Aurobindo Ghosh was born on 15th August 1872, to an Anglicised father Dr Krishnan Ghosh. He wanted his children to be schooled in English, therefore at the age of seven Aurobindo was sent to study in England. Aurobindo studied first at St Paul’s, London and then at Kings College Cambridge. Life in England was often tough for Aurobindo; resources were meager and for many years he had to often survive on a frugal diet. However he proved to be a scholar of great intellect and capacity. He mastered the classics and English poetry (later he wrote extensively on the English poets). The famous don Oscar Browning declared Aurobindo one of the greatest scholars he had seen. It was at Cambridge university that Aurobindo first became aware of the plight of his own country, at the time under the rule of the British Empire. Aurobindo became inspired to join a society committed to overthrowing British rule. This period was an important landmark in Aurobindo’s life. With his new political perspective he turned down an opportunity to join the British civil service. He had passed all his exams but failed to turn up for the obligatory horse riding test. At the age of 21, he returned to India increasingly committed to working for Indian Independence. On his return to Indian soil Sri Aurobindo was overwhelmed with a feeling of intense inner peace. This experience came unsought and was an indication of his future spiritual capacity. However at the time Sri Aurobindo’s main concern and main passion was political independence of his beloved motherland. Sri Aurobindo threw himself into revolutionary politics, associating with the great figures of Bengal such as Bipin Pal, B.C Chatterji. He was dismayed with the weakness of Congress and argued for direct action aiming for complete independence. Through his journal Bande Mataram, Sri Aurobindo was the first leader to call for the full independence for India. For several years Sri Aurobindo was a pivotal figure in the movement for independence. He had the qualities of a natural leader but was always happy to work in the background as much as possible. It was during this period that Sri Aurobindo also became increasingly interested in Yoga and meditation. 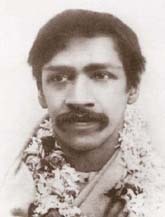 Whilst engaged in spiritual disciplines Sri Aurobindo came across a teacher of meditation, Lele Maharaj. He taught Sri Aurobindo how to control thoughts and not let them enter into his mind. Sri Aurobindo followed his instructions to the letter and within three days he succeeded in completely emptying the mind and entered into a state of nirvana. This same experience had taken Lele Maharaj over 6 years to attain. Lele Maharaj was amazed at the progress of the young Aurobindo. However it was the political struggle which held the greatest sway on Aurobindo, the freedom of India was his primary concern. After a fatal incident involving revolutionaries, Aurobindo became a marked man. In 1908 he was arrested for the possession of weapons and was held in jail for a year before his case came to court. His trial became a major event with much attention placed on the incident. The evidence against Aurobindo was quite weighty and he feared he would be convicted. However Aurobindo was fortunate to have C.R.Das as his defence lawyer. C.R.Das threw himself heart and soul in to Aurobindo’s defence. His commitment and capacity meant Sri Aurobindo felt completely assured and did not have to even concern himself with his own defence. By a curious stroke of fate it was in a British jail that Sri Aurobindo began to be seriously awakened to the inner life. Confined to his own prison cell Sri Aurobindo was able to practice meditation and read about the ancient principles of yoga, undisturbed by outer commitments. Sri Aurobindo began to have profound meditations. Entering into higher realms of consciousness he became aware of the omnipresence of God. As Sri Aurobindo himself said. It was also in prison that Sri Aurobindo was visited by the soul of Swami Vivekananda, who instructed Sri Aurobindo about the workings of the superconsciousness which was above the mind. Sri Aurobindo also became aware of a divine inner guidance, that was never to leave him. From this divine source he was given an Adesh ‘inner command’ that henceforth he should not worry about politics. India would gain her independence in due course but this would be achieved by others. 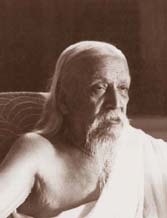 The task for Sri Aurobindo was the renewal of ‘sanatana dharma, the eternal religion.’ To pursue this spiritual task it was necessary for Sri Aurobindo to leave the political arena. In his own words Sri Aurobindo said of his mission. 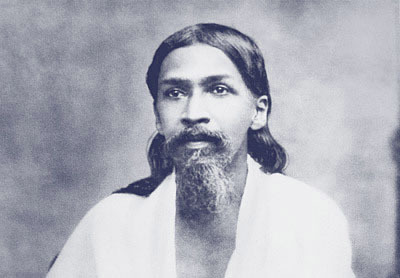 After gaining a dramatic acquittal Sri Aurobindo was released, but was still pursued by the British, who considered him ‘the most dangerous man we have to reckon with…’ It was around this time that he again came into contact with Sister Nivedita, a disciple of Swami Vivekananda and fellow revolutionary. She warned Sri Aurobindo of the dangers he was in. After a while Sri Aurobindo followed another ‘Adesh’ to move to the French province of Pondicherry. At Pondicherry Sri Aurobindo was able to dedicate himself fully to his spiritual disciplines. Despite frequent requests to return to politics, Sri Aurobindo spent much of his time in meditation becoming more aware of the supramental consciousness. Through his practise of Yoga Sri Aurobindo also gained the capacity to be a prolific writer producing many articles, writings and poetry. Sri Aurobindo was a rare combination of poet, philosopher, writer and spiritual Master. During his time in Pondicherry he wrote several books explaining his view on Yoga and spirituality. His most notable exposition was perhaps in ‘The Life Divine’ which is a comprehensive explanation of his integral yoga. 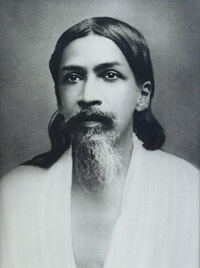 Sri Aurobindo was also a noted poet. Many of his poems are vivid and soulful portrayals of his supramental experiences. For example. Is here. A Peace stupendous, featureless, still. Or thrill with the luminous seas of the Infinite. It is rewarding to read these letters and also stories by disciples such as Dilip Kumar Roy who maintained a long and fruitful written communication with his Guru. In these letters and other writings Sri Aurobindo gives an insightful look into the play of cosmic forces that work unseen behind external circumstances. Although distanced from any direct involvement in politics Sri Aurobindo still took a keen interest in political events from around the world. In particular he saw in Hitler and Nazi Germany a great threat to the whole of civilisation. Therefore at the outbreak of the Second World War, Sri Aurobindo, the former revolutionary against the British Empire, came out with his full public support for the Allies and their cause. Some Indians who still saw Britain as the main enemy did not always appreciate this decision. However although Sri Aurobindo was a prolific writer he felt his main task was to bring down a new consciousness, which would usher in a new era where spirituality and truth were given a higher profile. But Sri Aurobindo went to great pains to say he did not wish to bring about a new religion or creed. As he wrote in his article ‘Sri Aurobindo On Himself. He offered a new vision of yoga and a spiritual path that could be followed by sincere seekers. However Sri Aurobindo never desired to have a large numbers of disciples or followers. He admitted his path was not always easy and could be quite arduous. But to attain a real transformation of one’s nature was not possible without maintaining certain spiritual standards and spiritual discipline. Sri Aurobindo taught that the different world religions were right in their own way. However Sri Aurobindo also stated that there was no need to repeat what had happened in the past. The world is in continuous evolution and there is a need to bring down a higher truth with each age. Continuing the vision of Swami Vivekananda, Sri Aurobindo sought to combine the best from Eastern spirituality and Western materialism. The massive barrier-breakers of the world..
After a short illness Sri Aurobindo entered his mahasamadhi on 5th December 1950. During his last illness Sri Aurobindo refused any major surgery or even to heal himself. He said by leaving his body he would most effective in continuing his spiritual mission. Sri Aurobindo’s life was of constant service to bringing down a higher ideal and vision.